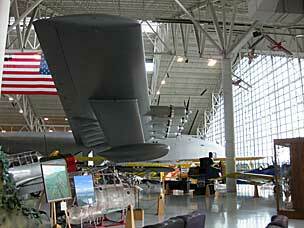 The Evergreen Aviation & Space Museum began in 1991 as a small collection at the headquarters of Evergreen International Aviation in McMinnville, Oregon. 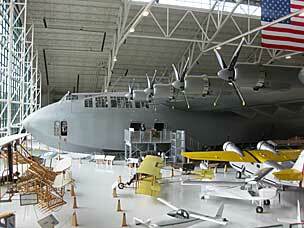 After acquiring the Hughes H-4 Hercules Spruce Goose, Evergreen built a new museum building, completed in 2001. The collection of military and civilian aircraft continued to grow, and in 2006 a second building was added to house spacecraft and related items. The Hughes H-4 Hercules was developed during the Second World War as a “flying cargo ship”, capable of transatlantic flight, to transport men and materials for the military. Shipping industrialist Henry Kaiser, who originally conceived the idea, collaborated with Howard Hughes on the first version, the HK-1. After 1944, Hughes and his company continued alone, now identifying the plane as HFB-1 and then H-4. Due to wartime shortages of strategic materials such as aluminum, the aircraft was constructed primarily out of a plywood-like composite of birch and phenolic resin called Duramold. 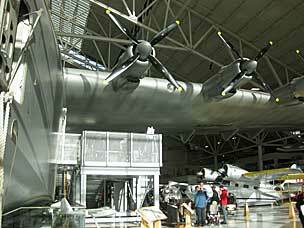 This earned sneering nicknames like “Spruce Goose” and “Flying Lumberyard”. Due to the enormous size, unusual construction techniques, logistical challenges, and the neurotic perfectionism of Howard Hughes, the H-4 prototype was not completed until almost two years after the war ended. On November 2nd 1947, with Howard Hughes at the controls, the H-4 made a few taxi tests in the waters off Long Beach, California. Then Hughes tilted the controls and the plane climbed seventy feet out of the water and flew for about a mile. It has never flown since that day. After the brief but successful test flight of the Hughes H-4 Hercules in 1947, the aircraft was quietly maintained until Howard Hughes died in 1976. After some debate about government ownership of the plane, it was displayed inside a geodesic dome next to the Queen Mary in Long Beach, California from 1980 to 1991. Then in need of a new home, the Aero Club of Southern California agreed to a proposal by Evergreen to build a museum around the Spruce Goose. 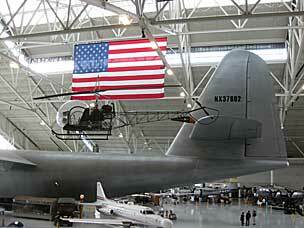 The plane was disassembled, transported by ship to Portland and then on trucks to McMinnville. There it underwent a multi-year process of restoration and reassembly.